Sometimes differentiating between a personal collection and institutional records can be a bit tricky. In the case of this collection we have papers collected and compiled by an individual – Eli Frank – but the collection deals exclusively with one organization – the American Jewish Relief Committee. So how did we handle it? In this case it made sense to focus on the institutional nature of the collection, but indicate clearly the person who brought everything together. And if this finding aid peaks your interest in either the person or the institution, we have more materials in our collection related to both. The Eli Frank Collection of American Jewish Relief Committee Papers was donated to the Jewish Museum of Maryland in 1983 as accessions 1983.74 by Shane D. Stiller. The collection was processed by Jennifer Vess in February 2013. Access to the collection is unrestricted and is available to researchers at the Jewish Museum of Maryland. Researchers must obtain the written permission of the Jewish Museum of Maryland before publishing quotations from materials in the collection. Papers may be copied in accordance with the library’s usual procedures. The American Jewish Relief Committee was organized on October 25, 1914 in order to raise funds to help Jews particularly in Russia, Palestine and Eastern Europe who were suffering because of World War I. The leaders of the national organization were mostly of German origin and well-to-do. 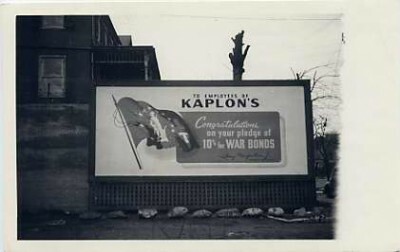 Only a month later the American Jewish Joint Distribution Committee was formed to ensure that funds from the American Jewish Relief Committee, the Central Committee for the Relief of Jews Suffering Through the War, and the People’s Relief Committee to ensure that funds were distributed effectively. Local branches of the American Jewish Relief Committee were formed throughout the United States and Canada including Baltimore. Chairman for the Baltimore Branch included Dr. Harry Friedenwald (1916), Julius Levy (1919) and Eli Frank (1922). Many Baltimoreans took part in the activities of the committee as members of the board or the various subcommittees or as donors. The American Jewish Relief Committee received endorsements from nation political leaders including presidents, local political leaders and local religious leaders both Christian and Jewish. 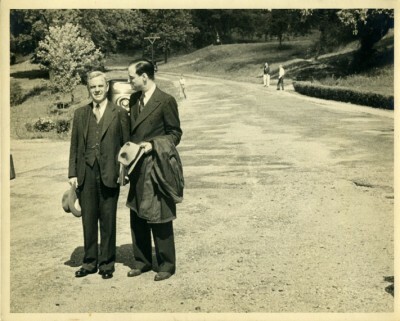 Eli Frank, Sr. (left) and Eli Frank, Jr. (right). Courtesy of Allina, Marcia Frank & Victoria Frank Albert. 1995.25.16. The Eli Frank Collection of American Jewish Relief Committee Papers contains newsletters, correspondence, invitations, reports and miscellaneous documents related to both the Baltimore branch and the national organization. The correspondence, from September 1921 through August 1922, makes up the bulk of the collection. The correspondence are organized chronologically and placed at the beginning of the collection. In 2002 we created the exhibition We Call This Place Home: Jewish Life in Maryland’s Small Towns. The exhibition looked at the many Jewish families and communities outside of Baltimore. Though most Jewish families chose to stay in the city, many others went out, settling in the state capital, western towns or along the eastern shore. 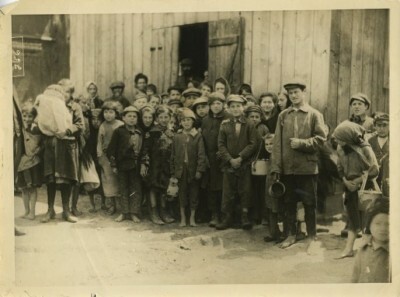 The JMM has a number of archives and photographs reflecting these communities. The following manuscript collection contains original documents and research materials mostly related to Frederick, Maryland. The Gordon Maryland Jewish Community Collection was donated by Paul and Rita Gordon of Frederick, MD in 1995 as accession 1995.104. The finding aid was written by Leslie McNamara. 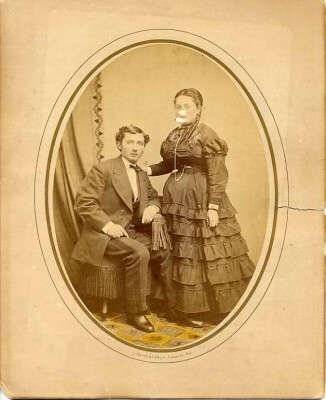 Frederick, Md had a thriving Jewish community beginning around the late nineteenth century. Prominent members of the Frederick Jewish community include: David Lowenstein and Benjamin Rosenour, businessmen, and Leo Weinberg, a lawyer. These members of the Jewish community in Frederick were influential in establishing a local synagogue. Frederick Hebrew Congregation was established in 1840 to serve the religious needs of the Jewish community in Frederick. In 1858, Rabbi Sussman Goebricher became their first rabbi. By the early 1900’s Frederick Hebrew Congregation was renamed Beth Shalom Congregation and on October 16, 1917, Beth Shalom was chartered and later incorporated in 1919. On September 2, 1923, Leo Weinberg donated a synagogue to the members of Beth Shalom Congregation, located at 20 West Second Street in Frederick. Preceding the generous donation of Weinberg, services for members of Beth Shalom had been held at a MasonicTemple. In 1976, the building was rededicated and renovated. In 1984, Beth Shalom acquired its first Community Center which housed all religious and social activities for the congregation. The Gordon Maryland Jewish Community Collection contains documents related to the Jewish community in Frederick, Md, the Jewish community in various communities within Maryland as well as various Jewish communities in other regions of the United States and Europe. The collection contains documents produced by organizations and individuals in the Jewish community as well as articles about the Jewish community in these areas. The collection is divided into the following two series: Series I. Frederick, Md, 1850-1995 and Series II. Jewish Community outside of Frederick, Md, 1894-1985. Series I: Frederick, MD, 1850-1995 contains historical documents and newspaper articles relating to the Jewish community in Frederick, Md including Beth Shalom Congregation, the Frederick section of the Council of Jewish Women, and prominent members of the Jewish community. The series is divided into two subseries. They are: Subseries A. Beth Shalom Congregation, 1882-1995 and Subseries B. Jewish Community in Frederick, Md, 1850-1989. Sub-Series A: Beth Shalom Congregation, 1882-1995 contains newsletters, bulletins, programs, and media articles relating to Beth Shalom Congregation. Materials are arranged with newsletters and bulletins first, events at Beth Shalom second, and newspaper articles and historical material arranged last. The papers within each group are arranged chronologically. Sub-Series B: Jewish Community in Frederick, MD, 1850-1989 contains materials relating to the Frederick section of the Jewish Council of Women which include programs, directories, treasury and minute’s books, and newspaper clippings that relate to the organization. This sub-series also includes business cards and receipts of Jewish businesses in Frederick, newspaper clippings and historic material relating to the Jewish community in Frederick, and biographical information about prominent citizens of the Jewish community in Frederick. Materials are arranged with the Jewish Council of Jewish Women first, Jewish businesses second, David Lowenstein third, Leo Weinberg fourth, and newspapers and historical material relating to Frederick arranged last. Materials within the Council of Jewish Women are arranged chronologically. 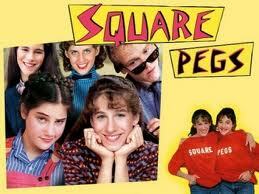 Series II. Jewish Community outside of Frederick, Md, 1894-1985 contains information relating to the Jewish community outside of Frederick, Md. 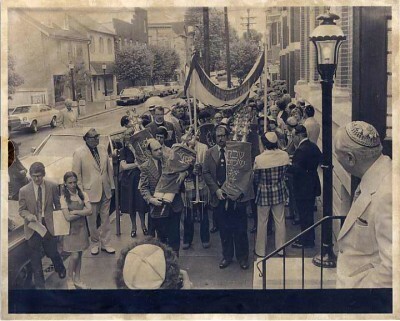 This part of the collection contains materials relating to B’nai Abraham Congregation in Hagerstown, Baltimore Hebrew Congregation in Baltimore city, Ner Israel Rabbinical College, and other various Jewish communities in Maryland. Also, there are various materials relating to Jewish communities outside the state of Maryland such as a copy of the book The Jews in Philadelphia Prior to 1800, a paper titled “Soviet Jewry: the Nationality Dilemma,” and materials relating to the article “Orthodox and Reform in the 19th Century Baltimore Jewish Community.” The series is divide into two subseries: Subseries A: Jewish Community in MD,1930-1973 and Subseries B: Jewish Community outside of Maryland, 1883-1985. Sub-series A: Jewish Community in MD, 1930-1973 contains information about various Jewish communities and institutions within Maryland. This sub-series contains programs relating to B’nai Abraham Congregation, Baltimore Hebrew Congregation (BHC) in BaltimoreCity, the Council of Jewish Women-Baltimore section, NerIsraelRabbinicalCollege as well as a paper relating to the split that occurred within the congregation at BHC. 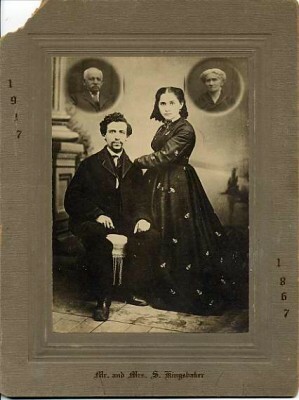 Also, there are materials in this sub-series relating to various Jewish communities in Md which include programs of various synagogues, historical publications of Jewish communities within Maryland, and an article titled “Orthodox and Reform in the Nineteenth-Century Baltimore Jewish Community.” Materials are arranged alphabetically. Sub-series B: Jewish Community outside of MD, 1883-1985 contains information that relate to various Jewish communities within the United States and in Europe. This sub-series contains various publications that relate to Jewish communities within the United States and Europe. In this sub-series, there is a publication titled The Jews in Philadelphia before 1800, a paper titled Soviet Jewry: The National Dilemma, and a collection of letters from the late nineteenth century that are written in Hebrew and Yiddish.. Materials are arranged chronologically by publication date. For decades museums, including the Jewish Museum of Maryland, used a bound ledger to record each donation. 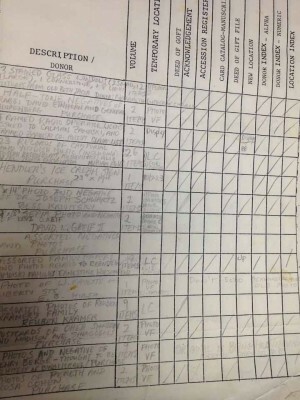 A separate ledger was used to track each incoming and outgoing loan. Later, we moved to a large three ring binder with a hand-written spreadsheet of information. 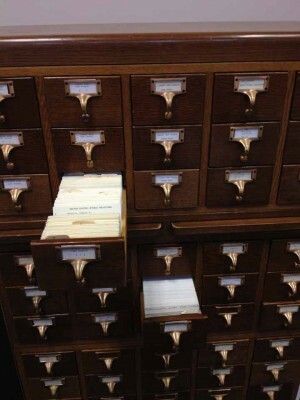 Individual cards were then written for each individual object, with separate cards for donors and each subject, all filed accordingly into the card catalog. Sorting and storing objects and photographs according to subject which was tremendously helpful for the registrar and/or archivist responsible for finding answers to research questions, or preparing for exhibition – and much easier than memorizing thousands of accession numbers! How research was done before Wikipedia! The JMM moved to its first automated collections management system (CMS) in the 1990s, but by early 2000 it was apparent that the DOS-based program was ill-suited for our diverse collections. Cataloging archival documents in a system designed for three-dimensional objects is truly like trying to fit a square peg in a round hole. There are a number of CMS to choose from so it was important that we found a system that worked for our needs without selling us on features that we would never use. PastPerfect was perfect for us! Geared toward smaller museums, PastPerfect offered a database with separate (color coded!) modules for objects, archives, photographs, library books, and membership which is ideal for our history-based collection. With the AASLH member discount, we couldn’t beat the price. The program is intuitive and easy to learn. Almost everyone on staff –as well as our interns and some volunteers—uses PastPerfect for research, programs, memberships, mailings, and of course, collections management . As the administrator, I can control access levels so that records can’t be accidentally deleted. Although we can attach 999 images to each record, my one complaint is that we can only attach them one at a time. 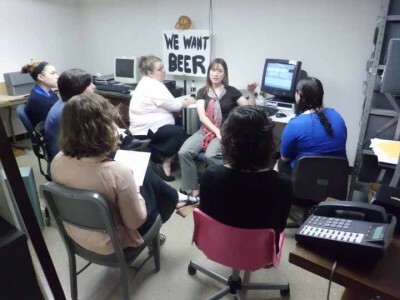 Jobi trains the 2012 education and exhibition interns on the research functions of PastPerfect. And we just can’t say enough about their customer service–friendly, knowledgeable AND helpful! While Brian, Ginger, Jannessa, and the gang have answered hundreds of questions for us over the years, the JMM has also been able to provide PastPerfect with some valuable feedback. For example, when we told PastPerfect that we really wanted to make the collections accessible to researchers, they developed PastPerfect on-line. 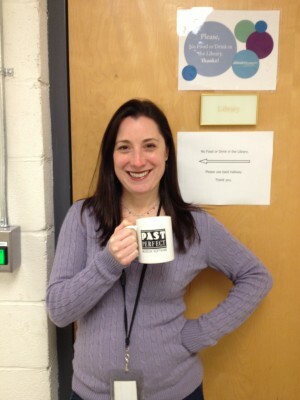 Darn archivist won’t let me bring my mug into the library, even if it is from PastPerfect! PastPerfect is constantly updating and improving their product, providing a complete explanation of how the changes will affect our work. The museum will be upgrading to version 5.0 in the next few months. Some of us are a little nervous about navigating the new interface, but the promise of enhanced membership and development features have us very excited. Collections management systems in general are on-going, evolutionary process. It should also be fascinating to see what the future brings and how “primitive” today’s technology seems 20 years from now.